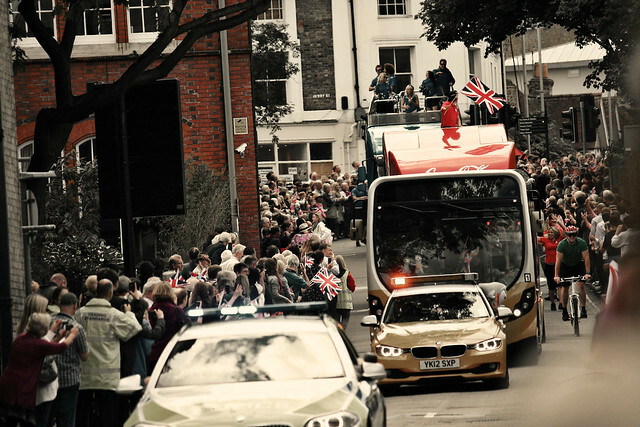 Ever since the Olympic Torch relay route was announced, a palpable sense of excitement rippled through the town. Lil L's school set about getting all the students to learn about the Olympics. She came home one day muttering words like Mandeville and Wenlock. Huh? Mandeville? Is that an estate? Car? What the heck is a Wen and a Lock? Are you speaking English? Exasperated, she did what most 6 year old would do - rolled her eyes and did that long drawn sigh. Like mom, like you're so like lame. It wasn't until I walked passed McDonald's one day and saw a poster of 2 of the ugliest monsters I've ever set my eyes on and realized that they were the Olympic mascots. The town was packed and practically heaving with out of towners and locals all vying for the best position to see the torchbearers. These lucky guys next to us were sipping yummy alcoholic fruit punch while the rest of us surreptitiously eyed their drinks with longing instead of watching our kids. 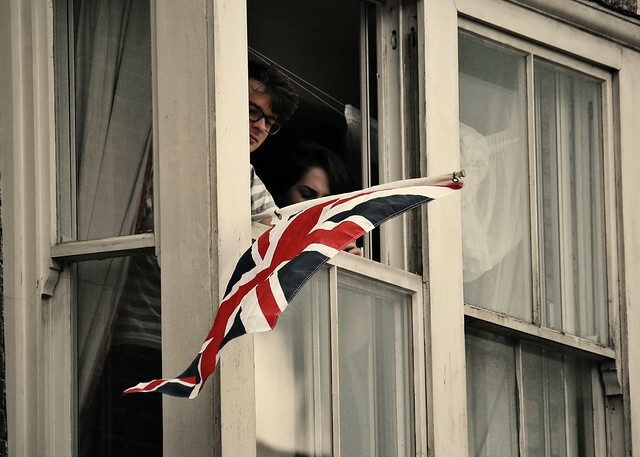 Pretty soon, Union Jack flags began to appear from the windows and backpacks. There were smart entrepreneurs who wanted to cash in on the occasion and plied the streets with overpriced Union Jack flags. 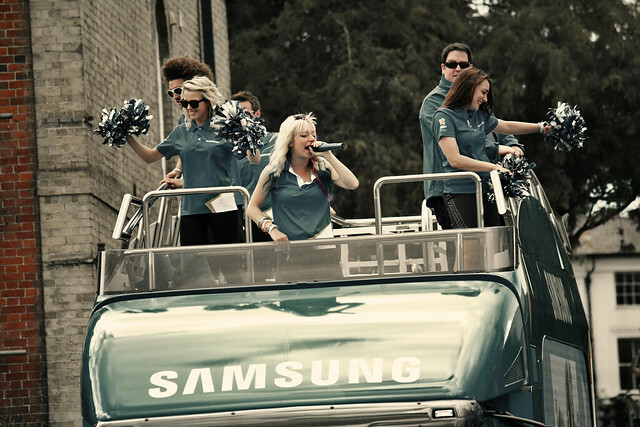 First we had this strange Samsung bus with pop music blaring from every direction. There was a lady with the mic who rapped/sang/screamed while the rest of us, kids included looked utterly bewildered by the "show". 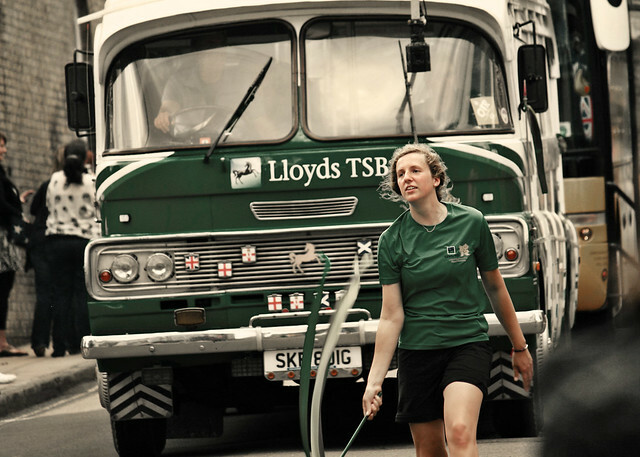 Followed by Lloyds TSB - for all your banking needs (note my sarcasm). And eeeeeeek. 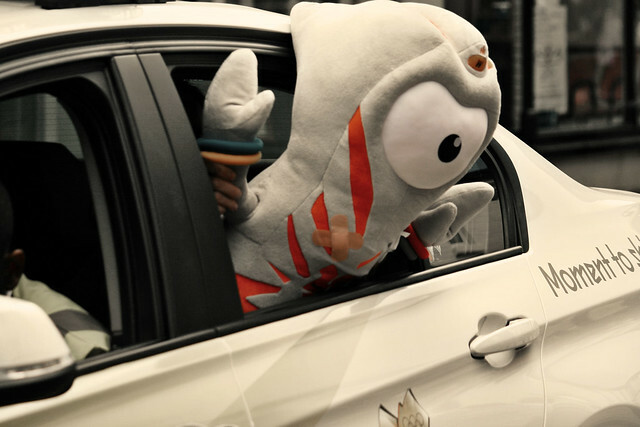 The one eyed monster....err......I mean Wenlock. Let's not forget Coca Cola who hired runners to hand out free cokes. And the moment we've been waiting for - the torch bearer. 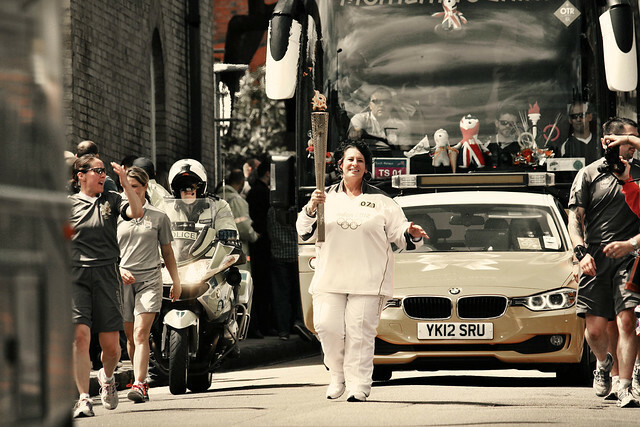 The Torch Relay lasts for 70 days involving 8000 torchbearers, all nominated from their various achievements and passes through more than 1000 cities, towns and villages in the UK. I was a little teary eyed when I saw the look on her face as she ran past. She radiated utter joy, humility and pride, having been chosen from hundreds of thousands of individuals to participate in this once in a lifetime occasion. Aren't the mascots so funny? 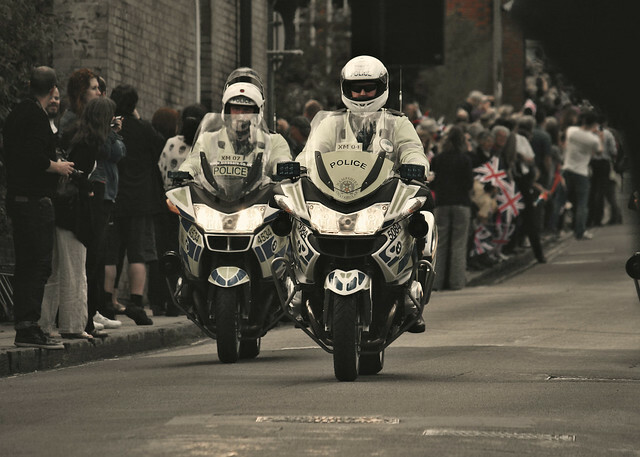 I was kind of shocked when I saw them, London has been very...original in a lot of choices for the Olympics, LOL! What a fun event to witness! So fun! You're right - the mascot is a little odd! These are awesome photos Marlene! It must have been such a cool experience to see this and like you said, how awesome to be selected as the torch carrier! Thanks for sharing! wow amazing photos! what a cool event!!! wow such a wonderful thing to witness ;) can't wait for the olympics to start! 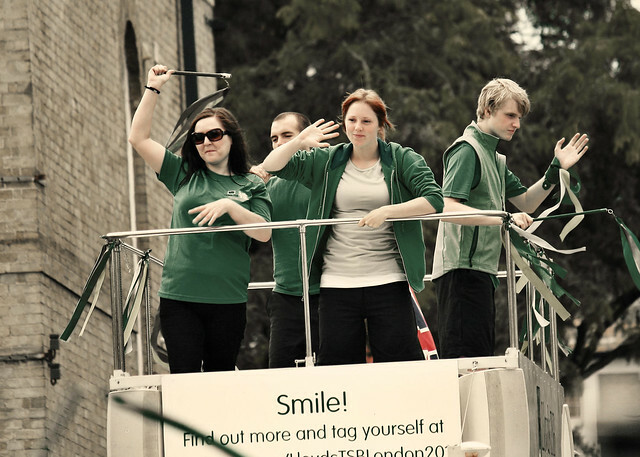 when the initial london2012 design was revealed the design community was quite divided.. no surprise about the mascots! Lucky you. I would have loved to see this. 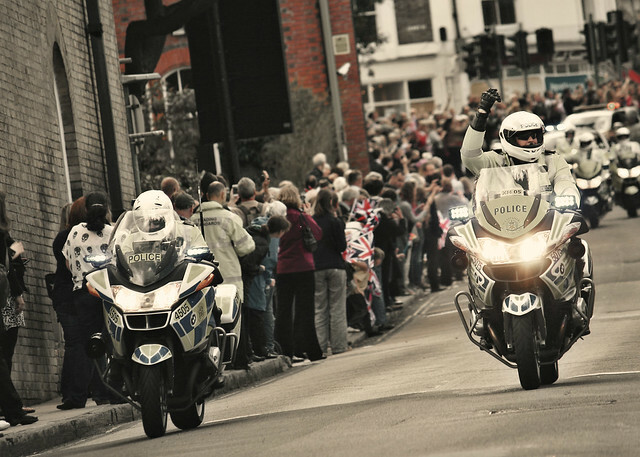 We went to see the torch procession a few weeks back in the next village. Not quite as big a turn out as yours but still enough to make it a lovely event with all the children out and waving. Like you say - what's with all the sponsors floats? I have to say we had quite a good looking torch bearer - all the mummies were going swoooon! It must be such an amazing honor if you are chosen to carry the torch! I`m getting goosebumps even thinking about it. My dream is to go and see the olympics but this year I didn`t have time, sadly. Hahaha....mine weren't swoon-worthy like Sue's either. I caught a group of police officers in one of the vans flirting with a cute blonde standing near me. This pictures are amazing! You really captured the spirit of where you were and now I want to go there. Marlene, every Olympic monster...OOPS, i mean mascot that I've seen has been ugly! What is up with that? I wanna know who designs the mascots! They should be FIRED! HAHAHA Your take on it was too funny! I didn't know their names so thanks for sharing that. This post was right up my alley. So glad you documented it, because I appreciate it. 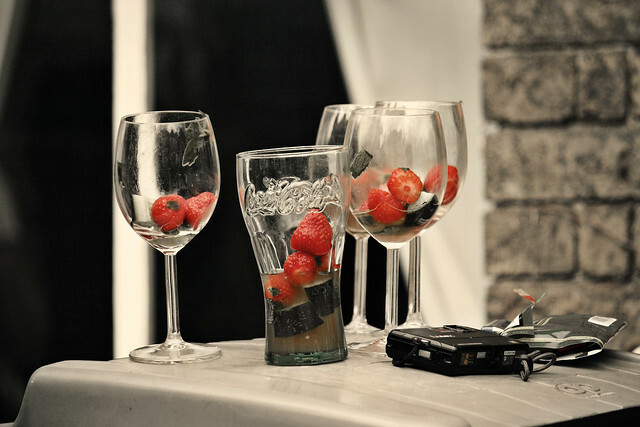 Those drinks look so yummy! They didn't share? HAHAHAHA LOL at Coca-Cola! They are everywhere. Great coverage of this event Marlene! LOVED IT! I think it is amazing you got to witness this! Love the last pic. Eye rolling starts at age 6?!? Ack - only a few more years for my little guy, LOL. Very cool to be able to witness all of the Olympic-related festivities! Scary, isn't it? They try to be sassy too. Oh I'm getting so excited for the Games. Thank you so much for sharing these images and funny thoughts. How invasive advertising can be, especially when it's junk food around elite sport, is really quite crazy! bet you all are excited for olympics!!! that's so cool to be there for you!!!! PS: Yes, the mascots are very ugly! Such fun pictures. I'm happy that lil L got to experience the event. The torch came by my elementary school when I was little and everyone came out to cheer- I'll never forget that excitement. 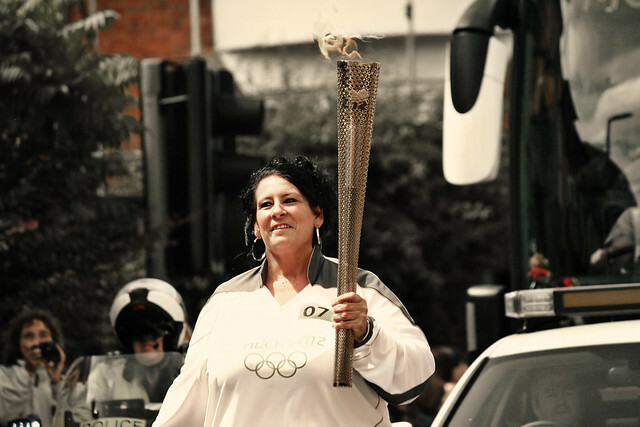 It was even more special since a family friend who is phenomenal was the torch bearer. Great photo's. It must be such a treat living in the UK. I swear there is always something happening and it's really nice to see the whole community getting into the spirit of things. You photos are always so crystal clear, I feel like I'm there. 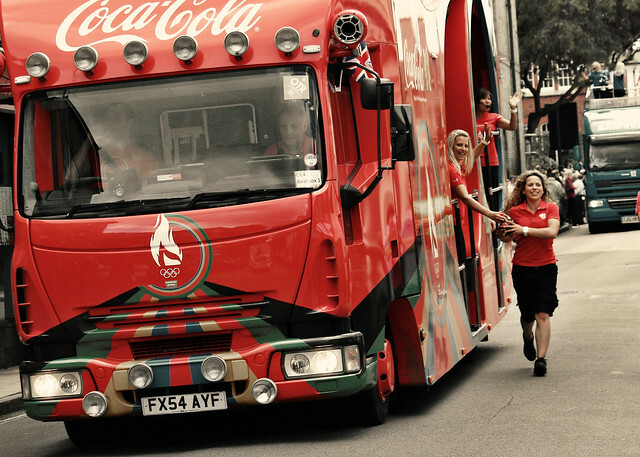 So lovely to see the expression on the torch bearers face! Hahaha I had no idea there were Olympic mascots! Umm that first advertiser/rapper seems a little out of place, not that the rest are any better. The constant commercials during the Olympics drove me and my husband crazy. Your pictures are amazing, thanks for sharing!